These books are products of Shanti's life long study and application of Yoga in his daily life, introspection and teaching experience. They offer guidance for a lifetime. This is the fifth book in Yogi Shanti Desai’s series on Vedanta philosophy. The Threefold Path to Bliss incorporates the essence of the ancient scriptures and great masters into a simple daily practice that is suitable for people of all faiths and levels of spiritual advancement. Written in a readily comprehensible style and accompanied with affirmations and reflections for constant guidance and inspiration, the text makes clear that by following our personal duty (dharma), becoming still, and inquiring within, we can realize the interconnectedness of all things and the blissful nature of our own Self. Threefold Path to Bliss is also available through Amazon.com. Purchase all five Vendata Philosophy Series books here and save $5.00. We are at a time in history during which we have made exponential advancements in technology and communications. Comforts and information are available at our fingertips. But so much information has confused us, and technology has made us slaves. Society is mesmerized by illusion. People have lost the capacity to think, choose the proper direction in life, and experience peace. This book offers guidance that can transform life. It offers a contemporary approach to meditation that is suitable for people of all beliefs, ages and temperaments. A simple threefold path is advanced. The path requires only that we become still and introverted and rediscover the essence of our being which is peace. Give up dogmas, effort, mechanical discipline and running outward in search of happiness. Learn to be empty, aware, and in the present. Wake up here and now to realize that you are perfect where you are. Peace is your essential nature. You do not need to go anywhere or do anything. You are already there. Spiritual Awakening in the Age of Kali Yuga is also available through Amazon.com. “The entire universe is a unified field of consciousness and the matrix of all creation. It is the eternal reality. The temporary world is merely projected upon it. Everyone is like a wave in this cosmic ocean. Everyone and everything is interconnected. We have the potential to achieve whatever we desire. All we need to do is to have intense desire, and perceive, believe, feel, and project our own reality. Quantum Leap to Liberation is also available through Amazon.com. Are you looking for a goal and direction to balance your life? Awaken from cosmic illusion (Maya). Manage life by balancing energy, money, time and spiritual wisdom. Learn meditation to quiet the mind and experience bliss. Learn affirmations to reprogram your unconscious mind. Use spiritual reflection to clarify vital issues of life. We are programmed constantly from childhood. Parents, schools, religion, environment and experiences have hypnotized us. These experiences are stored in the unconscious mind and control our life. We are running in circles without knowing propose of life. Yogi Shanti Desai has used his 48 years of yoga teaching experience to give insight on how to break the cycle and reprogram our unconscious mind. Wake Up is also available through Amazon.com. Perfection and bliss is essential human nature. We do not need efforts to attain it. We need to remove veils of ignorance and realize it. If you have a nightmare, all you need to do is to wake up and become free. The philosophies and scientific principles in this book can wake you up and change the course of your life. This book is meant to inspire the reader. Beginners can learn simple meditation techniques to observe breath and awareness and get firsthand experience of peace. Advanced practitioners can delve into ancient Vedanta philosophy. Self-inquiry and affirmations are suitable for all for daily inspiration and guidance. Zero Is Infinity is also available through Amazon.com. 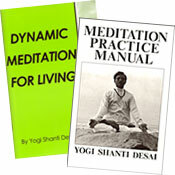 Dynamic spiritual principles based on the life of a yoga master. Yogi Shanti Desai has been studying and practicing spiritual principles since he was a child in India. Now, at the later stages of his life, he shares spiritual truths candidly, both those that he has followed with success, and shines a light on some of the misguided ideas being circulated in society in the name of spirituality. This book will guide the reader through a process of spiritual transformation and show him how to create a dynamic and balanced life. Dynamic Spiritual Transformation is also available through Amazon.com in paperback and Kindle editions. The Secret of Bliss gives direction on how to use the world with awareness and to transcend it to attain lasting bliss. It provides contemporary interpretation and application of ancient scriptures. The author draws revolutionary comparisons between the ancient scriptures of India and modern scientific thought to unravel the mysteries of our connection to the universe and the secret to tapping bliss. It features a Self Inquiry Quiz for introspection and simplified meditation techniques. In Wisdom for Living, Yogi Shanti Desai is inspired to delve into the ancient Yogic philosophies to further examine the journey to self realization. Each section contains short quotes and affirmations to make this inspirational book a joyful and effortless read. This book is about Self-realization and personal transformation. The book begins with a discussion on spiritual awakening, followed by a look at the awareness of self and the personal journey of transformation. Personal to Global Transformation is also available through Amazon.com. This book shows the parallel of Vedanta teaching with modern quantum physics that validates ancient Vedanta teachings with scientific facts. The entire universe is an interconnection of consciousness and energy. We are the co-creator of our destiny. It teaches how to transform your life and create your own miracles. 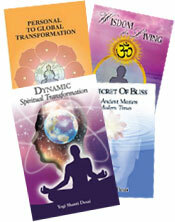 Purchase all three Dynamic Series books here and save $4.00. This book is a simplified version of meditation for laymen that can be used during normal activities. It provides clarity and removes misconceptions about meditation. It is comprised of four sections, which include a beginner's introduction to meditation, three ancient classical philosophies, and seven meditation techniques based on classical Hindu tradition followed by practical instructions for application and guidance. Dynamic life is to get the most out of life by learning to flow with life. First one explores his primary and secondary goals and awakens inner potential. Then he balances all phases of life with efficiency to gain maximum benefits. He uses a dynamic approach in all situations and flows with life. Anyone who can think and breathe can achieve it. Yogi Shanti Desai explains the veils of illusion that cover the everlasting Self in a modern manner, giving the reader plenty of anecdotes, stories and examples to ponder. He gives many thoughts for introspection and meditation techniques to transcend cosmic illusions (Maya). It is the perfect companion of Reality Here and Now to read before and after meditation or waking/sleeping. It will help the spiritual seeker stay on the path. Self - I Me Mine Ours Illusions is also available through Amazon.com. This book explains essential ancient philosophies of India in a simplified form. Yogi Shanti Desai, a master of yoga, distills the essence of Vedanta and Sankhya philosophy, and explains esoteric philosophical concepts in a modern manner. The book is so dense with knowledge, you may find yourself rereading areas and pondering their meaning to get full disclosure. Reality Here and Now is also available through Amazon.com. This 60-minute DVD can be used along with Shanti's Hatha Yoga Practice Manual by Yoga students of all levels. It is an inspirational workout that can be viewed over and over again to gain depth of yoga practice. This book focuses on the art and practice of meditation in a scientific way. Anyone can enhance the quality of their life through meditation. One can choose the techniques of Gnana, Karma, Bhakti or Raja Yoga to suit their temperament. Practical guidance includes preparation, aids, obstacles and benefits of meditation. The topics of prayer, dream, death, faith, love and non-attachments are simplified. Originally published 1981. The NEW Meditation Practice Manual is also available through Amazon.com. Complete book of Yoga Asana practice from beginner to advanced levels. It gives instruction in preparation, rules, caution and benefits for practicing yoga. It provides guidance for practicing daily routine. It also gives various breathing and cleansing techniques and introduces Kundalini Yoga. Want to know everything about yoga? Read this book. 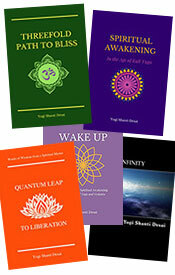 Distilled and prepared by Yogi Shanti Desai, a lifetime practitioner and teacher. 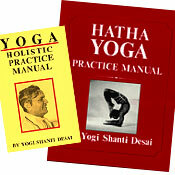 This book contains information about all branches of yoga to balance body, mind and spirit. The practice manual has been used as the foundation for several yoga teacher trainings and will teach you everything you need to know about yoga and how to apply it. Originally published 1976. 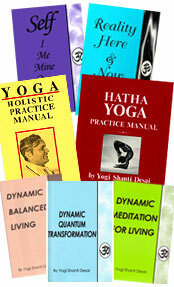 Yoga Holistic Practice Manual is also available through Amazon.com. Holistic Practice Manual; Hatha Yoga Practice Manual; Meditation Practice Manual; Reality Here and Now; Self - I, Me, Mine, Ours, Illusions; Dynamic Balanced Living; Dynamic Meditation for Living;	Dynamic Quantum Transformation; Personal to Global Transformation; Wisdom for Living , The Secret of Bliss and Dynamic SpiritualTransformation. Holistic Practice Manual; Hatha Yoga Practice Manual; Reality Here and Now; Self - I, Me, Mine, Ours, Illusions; Dynamic Balanced Living; Dynamic Meditation for Living	and Dynamic Quantum Transformation - a perfect addition for your yoga collection; ideal for yoga schools and studios.